Recently I have been preparing toys for a loan to Palace Green Library in Durham, for their upcoming exhibition ‘Books for Boys: Heroism, Adventure & Empire at the Dawn of the First World War’. The exhibition looks at the golden age of children’s books, from late Victorian, through early 20th century, and is part of a series of exhibitions linked to the centenary of the start of the First World War. My fantastic conservation volunteer Susannah prepared condition reports for all of the objects, she photographed them, checked for wobbly bits (not a technical term), and packed them safely in travelling crates for the journey. Alongside the bandsmen, we’re lending a clockwork car, GNER engine and carriage, and two dolls. 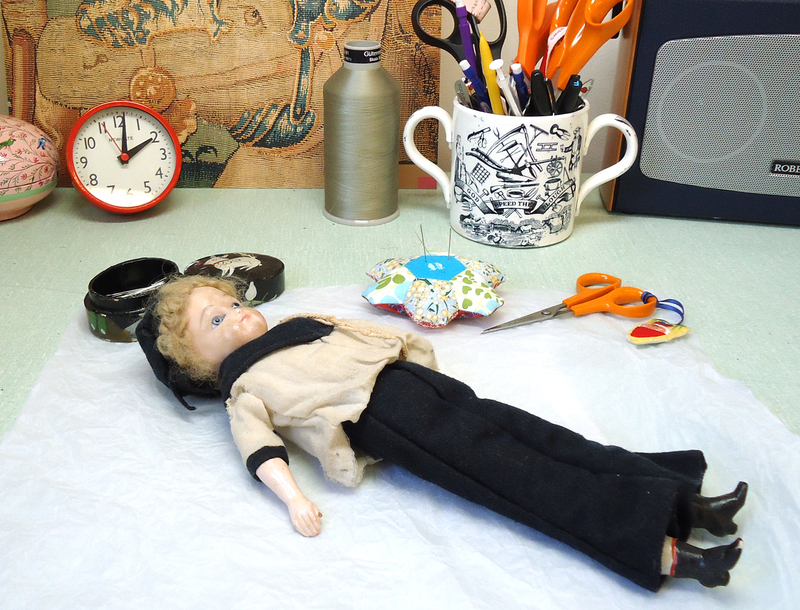 I have been checking that the two textile objects – a sailor and a soldier doll – are fit for travel and display. 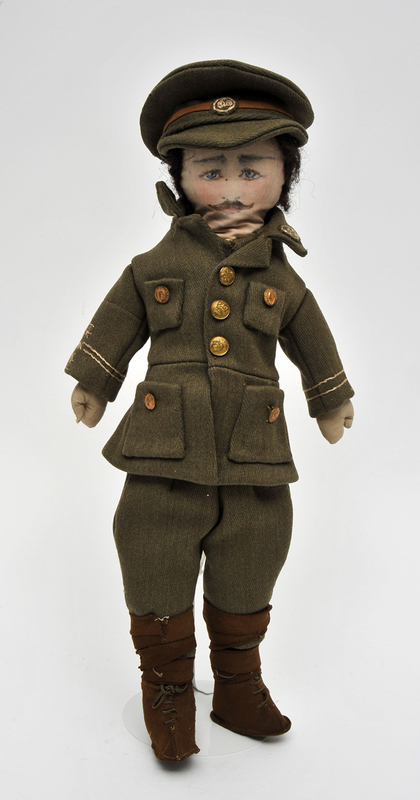 This rag doll, dating to 1916, is dressed in full WW1 uniform, and is quite large, at 50cm tall [Toy.110]. We know very little about him, he came from an unknown donor, and the records state that he was ‘found in a cupboard’ before entering the museum’s collection. His tag names him as ‘Tommy Atkins’, and with a hand-painted face, and detailed costume, he looks to be a home-made gift for a child. He has survived in very good condition, save for a few moth holes in his woollen jacket. This smaller sailor doll [Toy.152] has composition arms and legs, a soft body, stuffed with straw, a wax head with glass eyes, and short curly blonde hair. His sailor’s uniform is made from wool, and has suffered extensive insect damage. He needed about 6 hours of conservation to get him ready for loan – involving patching the holes in his clothes, and re-securing the loose seams. This doll was presented to The Bowes Museum in the 1980s by Mary Broke, and he is thought to date circa 1912. The exhibition at Palace Green Library will run from 27th September 2014 until 11th January 2015. I think the curator of the exhibition should have ensured it would be gender neutral, as it is it pretty much states what it imagines as the target audience as boys…..when girls could be just as interchangeable, or using a gender neutral word like people, children, etc. But other then that the soldiers and that train look amazing. 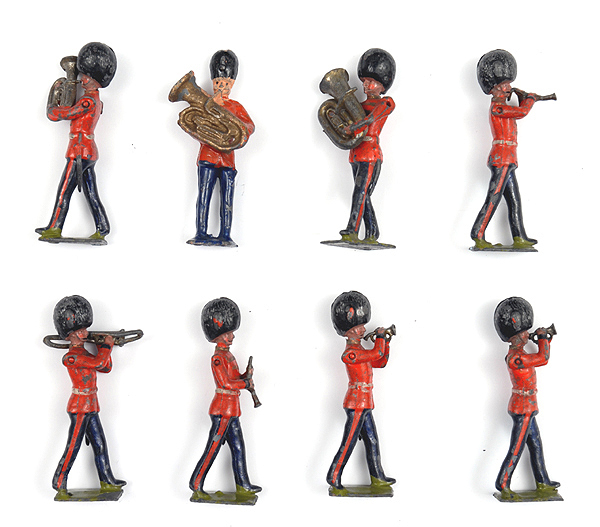 When making the soldiers would they have used a mould?